Our mission is to foster the creation of communities actively working to address the inequalities and systemic barriers that make sustainable communities and self-reliant life-styles unattainable. We are committed to supporting and creating justice-driven community-based programs and educational initiatives, which seek to foster dialogue, and create awareness and critical consciousness. We envision equitable, healthful and sustainable communities that are self-reliant, inter-relating and where every individual has the support and resources needed to develop to their fullest capacity. 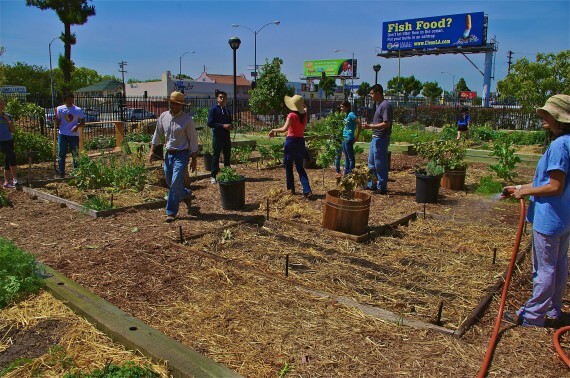 Program Description: Every Tuesday and Saturday we have volunteer work days on our mini urban farm at the expo center. This farm not only is a learning space, but also has provide produce to over 9,000 families in the community. Volunteer Roles & Responsibilities: Volunteer’s responsibilities would be helping to increase produce production by planting, harvesting, and weeding, all while learning about food systems. Volunteers would be a vital piece in our effort to develop local food systems. Requirements: Please wear light colors and clothes and shoes that you don’t mind getting dirty, bring water and snacks if you want them. We look forward to seeing you. Benefits: Volunteers will be able to experience where their food comes from and learn how to garden it.